Gregg Braden studied the Essenes who were the early followers of Jesus (Yehoshua) by going to different monasteries and studying their ancient writings to get a better view of what they believed. After his studies he came up with the Seven Essene Mirrors to describe how they believed this world reacts to us and our emotions. It is heavily tied to Jesus (Yehoshua) who told us to pray with faith in his name/character and then what we prayed for would be done. Our faith is what causes it to occur. For more information on him, check out the Gregg Braden’s Teachings page. The idea behind the Essene Mirrors is basically the Golden Rule. These life experiences we go through are here to get us to judge ourselves before judging others, love others as we would want to be loved (unconditionally), and then love ourselves with that same unconditional love, in which case the world will be a more loving and accepting place to be! The law of attraction is basically defined as the ability to attract what you’re mentally focusing on through the power of programming your subconscious with new thought patterns. You become mindful and rather than letting the mainstream media, or friends and family tell you what you can and cannot do and what you should or should not do, you can wipe away the old programming code that you used to rely on to create your world, and instead write new code to create your world. Our subconscious is a fertile garden that takes seeds of thoughts and lets them flourish into our realities. Usually people listen to TV, movies, teachers, parents, friends, advertisements and more and let those thought patterns enter into their subconscious. Their agreement or disagreement with these external thought patterns determines whether the thought pattern “seeds” get fertilized or not. Thought patterns such as “you can’t get a good job without going to college” will be allowed to grow into your reality if you believed that when you heard it. However if every time you heard someone say that to you, you thought, “That’s not true. Plenty of people have great jobs without going to college,” then you will not let those seeds mature into your reality. This is why we were told to think on positive things and not allow negative things to even enter our sight/minds. Philippians 4:7 And the peace of God, which surpasses all understanding, will guard your hearts and your minds in Christ Jesus. 8 Finally, brothers, whatever is true, whatever is honorable, whatever is right, whatever is pure, whatever is lovely, whatever is admirable — if anything is excellent or praiseworthy — think on these things. 9 Whatever you have learned and received and heard from me, and seen in me, put these things into practice. And the God of peace will be with you. 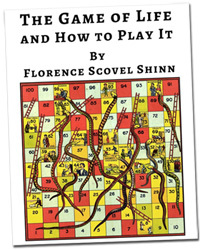 Florence Scovel Shinn’s book, “The Game of Life and How to Play It,” goes through the “rules of the game of life.” The book combines the ideas of the law of attraction and how to reprogram your subconscious into creating a better world through affirmations. For more information on her and her ideas, see the page Florence Scovel Shinn. Affirmations are basically the new thought patterns that you want to code your subconscious with. Examples include, “I am thankful for this wonderful business in a wonderful way, where I give wonderful service for wonderful pay,” “I am a blessing to others and everything works out perfectly,” or “I am loving and kind, and others are loving and kind towards me.” These are basically prayers that are said knowing they’ve already been fulfilled because God knows what you want before you ask for it. We just have to do the asking. We have to affirm they’ve been granted through our faith. For more information and a list of affirmations see the Affirmations page.